On Wednesday Colin had a half day at work, so we all got to spend the afternoon together. We went bowling, it Joshua's first time and so much fun! He thought every go was his and kept trying to lift the balls by himself! With a little help from Daddy, Daniel whooped us all, and he was so proud. He's going to be competitive, just like his Daddy, he pouted every time he missed! Mr Independent sent Daddy to sit down once he's set him up so he could push the ball down the ramp himself. Joshua had to stand on his tiptoes, too cute! After that we went to play in the arcade, the boys sat in the racing car chairs and pretended while Colin beat me at air hockey and then set a new high score on the basketball game. 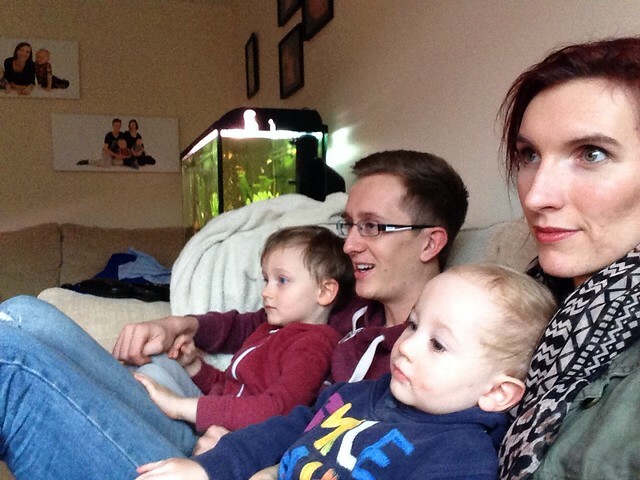 When we got home we all snuggled on the sofa to watch In the Wild, a film about zoo animals that escape into the wild (would you believe!) It was literally the best day, we all had so much fun!